It’s no secret that eating and drinking after a workout (or a night out) is important. It not only replaces lost fluids and brings your blood sugar levels back up, it actually shortens your recovery time if done within 30 minutes of working out. * That’s why I try to get a smoothie in after a gym session. 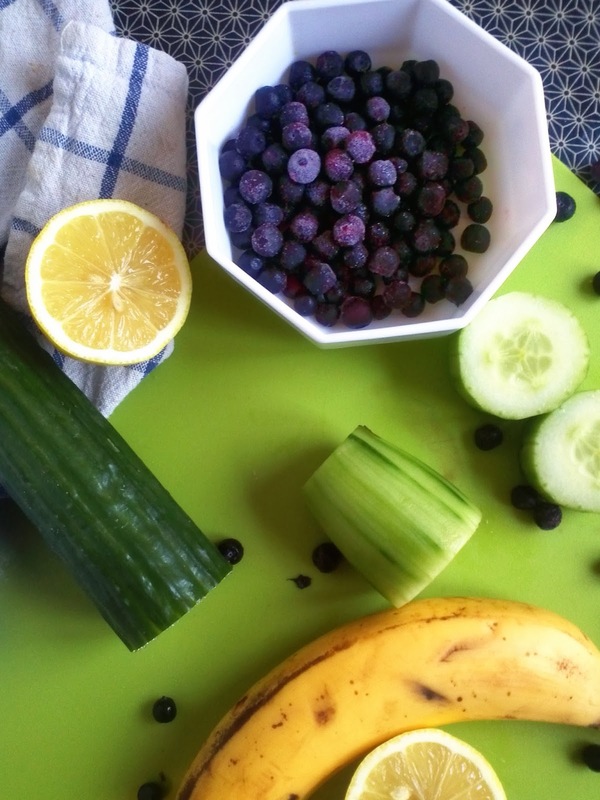 My go-to recipe is just banana, cucumber and lemon with a few berries for a splash of color and antioxidants. It gives your body fluid and a little boost of potassium and magnesium to prevent muscle cramping, helps replace muscle glycogen and neutralizes the acid that forms in your body from exercise (and alcohol!!). Plus a tough workout (or night drinking) can weaken your immune system. The vitamin C from the fruit and veg helps boost your defenses. This smoothie is very light intentionally. If you want to thicken it up add less liquid. For a little more protein (the optimal post-work ratio of carbs to protein is about 4:1), feel free to blend in some soaked chia seeds or quality protein powders. If you want a stronger alkalizing effect, leave out the berries and add a few leaves of romaine lettuce in. I promise you won't even taste them! Hydration: After sweating it out at the gym or a late night out, you need to replace those fluids! The fruits and veg really make the water more enjoyable to drink. Faster recovery: The carbs help stimulate insulin production which aids in replacing muscle glycogen. Acid neutralization: Working out or drinking alcohol causes your body to form acid. To neutralize this acid, your body uses valuable minerals, like zinc, potassium, iron and calcium. Cucumbers, bananas and lemons (yes, even though they are acidic) have an alkalizing effect on your body. This way you don’t lose valuable minerals! Blood sugar boost: After working out or drinking, your blood sugar is likely on the floor. Having easily digestable carbs helps bring it back to a healthy level and ease a headache. Immune system boost: Vitamin C! Antioxidants: The antioxidants from the fruit (especially the berries!) help fight the oxidation process that can cause damage to cells in your body. Flushout toxins: The lemon also stimulates your liver to flush out toxins, which is extra important after drinking! Extra potassium and magnesium: Help prevent muscle cramping. 1. Put everything in the blender, blend and enjoy!